With St. Patrick’s Day just passed once again, it calls to mind our visit to the charming Brennan’s (aka. ‘The Criterion’) pub in the coastal town of Bundoran, Co. Donegal. Brennan’s opened in 1900 on St. Patrick’s Day and has been delighting patrons ever since. 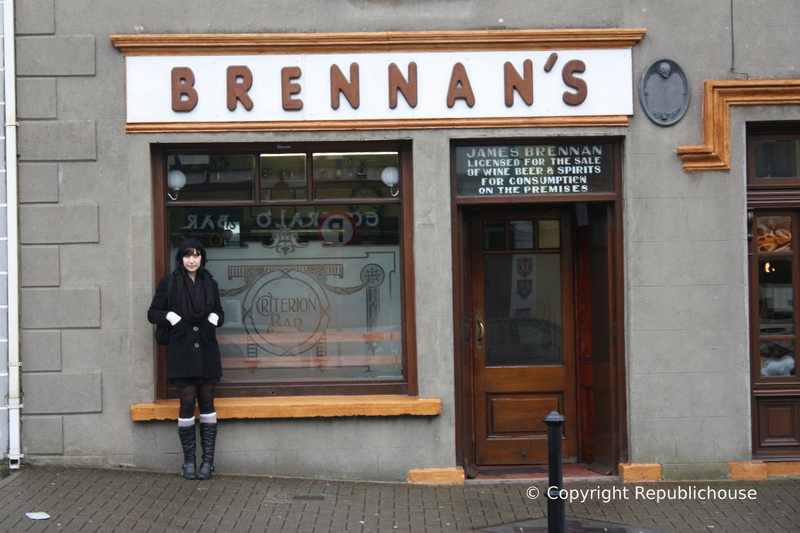 Few pubs that we have visited on our travels, have left such an indelible impression as Brennan’s. It is a place entirely locked in time, unspoilt and genuinely offering a glimpse of a bygone era. One of the common traits of these fine, old pubs is their capacity to steadfastly remain authentic and unaltered in the face of a rapidly, changing world right outside their doorsteps. Nowhere in Ireland is this resilence more pronounced than in lovely Brennan’s, sitting discretely on the main street in brash, tourist-focused Bundoran. What lies beyond its understated frontage is a pub of delightful character, offering tranquility, charm and homeliness. Add to that, the friendly welcome you can expect from the Brennan sisters, Nan and Patricia (grandchildren of the original founders of 1900), and you have a pub that’s pure magic! On the day of our visit, Bundoran was looking bleak amid the lashing rain of late October. The town’s multi-coloured, neon shopfronts looked out-of-sync with the greyness of the season. It was late afternoon and we were just stopping off for a few hours en route to Sligo Town having spent the previous night in Donegal Town, but Brennan’s had been on our ‘pub radar’ for a while. When we had the chance to drop in, we weren’t going to let it pass. Generally on our pub hunts, we try to spend at least one entire evening in the pub in question, in order to experience it at full tilt, bustling with its regular customers but Brennan’s is a different type of pub and is no less special for seeing it in its tranquil early evening demeanour. On walking in, there was an intimate snug immediately to the left, sandwiched nicely between the front window and the tail end of the bar counter. The polished, pine-wood counter ran the length of the left-hand side of the main bar. High shelves stood behind the bar to ceiling height, stacked with copperware, bottles and knick-knacks. To the right, lay a door to a homely lounge bar, which is were we eventually nestled ourselves with pints, right by the window, looking out at the wet, grey day. There were only a handful of local folk in the main bar when we arrived, chatting amongst themselves but they had extended a friendly howdy and a nod our way. Either Nan or Patricia served us our pints (I’m embarassed to say I’m not sure who is who), quick and friendly, which was all we really needed after the drive in the rain. There was no television (always a promising sign i.e. there’s enough ‘craic’ without it) and the only soundtrack was the babble of the conversation from the few customers there. Brennan’s is one of those pubs best suited for a quiet pint in fact, whereby you can ‘hear yourself think’, similar to the Sackville Lounge or Neary’s in Dublin or Murphy’s in Galway. It affords a proper stopover for a dose of serenity with your newspaper or a conversation with a few like-minded souls, over a decent pint of Guinness. You know the score. The lounge bar on the right was noticeably deserted, but we were suitably intrigued and had wandered in with our drinks anyway. The hard tiled floor of the main bar gave way to patterned carpet underfoot, as we crossed a hallway with a wide staircase in order to reach the lounge. These stairs would once have lead to guest bedrooms as The Criterion, originally built in 1823, began life as a guesthouse before its role as a pub commenced in 1900. We entered the lounge, which was cosy and sedate. The room was more indicative of someone’s home than of a public bar. This is hardly surprising though, given that the Brennan sisters have actually lived in the pub itself, all their lives. It is not simply a public house, it is a private house too. You can tell. The care and attention that have been bestowed upon it in preserving its classy 1940’s finish is obvious and part of the pub’s rare character. 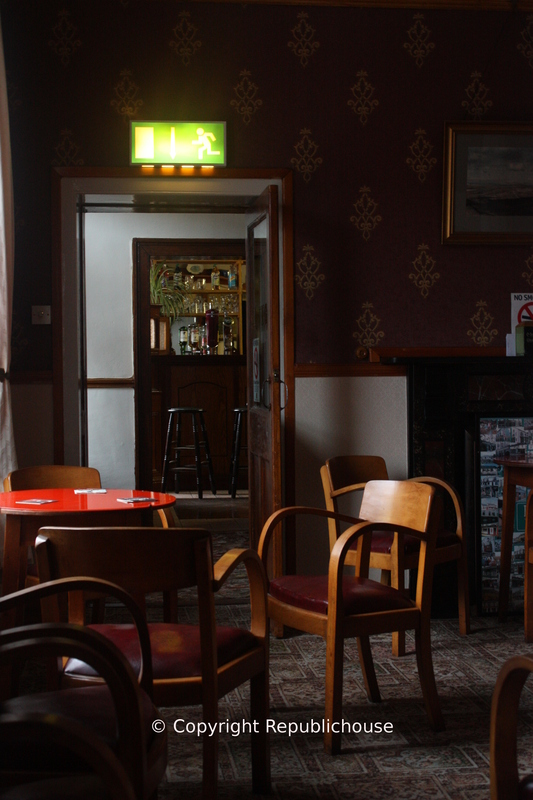 The interior you see today dates from 1947, when the bar was entirely redecorated to cater for the well-to-do holidaying patrons who frequented ‘breezy Bundoran’, a top destination for Irish tourists, similar to how Brighton has been a favoured seaside resort in England. Sadly, with the closure of the rail link in 1957, the impetus for Bundoran’s perennial popularity was lost and the town faded somewhat. The quiet, unassuming nature of the pub plus the 1940’s interior decor, complete with solid tables and chairs from Arnotts in Dublin and immaculate wallpaper, carpets and pictures from that period, provide a unique archive of Irish life. It is more common for old Irish pubs that remain popular today to originate from, or at least hark back to, the late nineteenth century or Victorian era. Brennan’s offers an alternative freeze frame of a post-WWII Ireland. 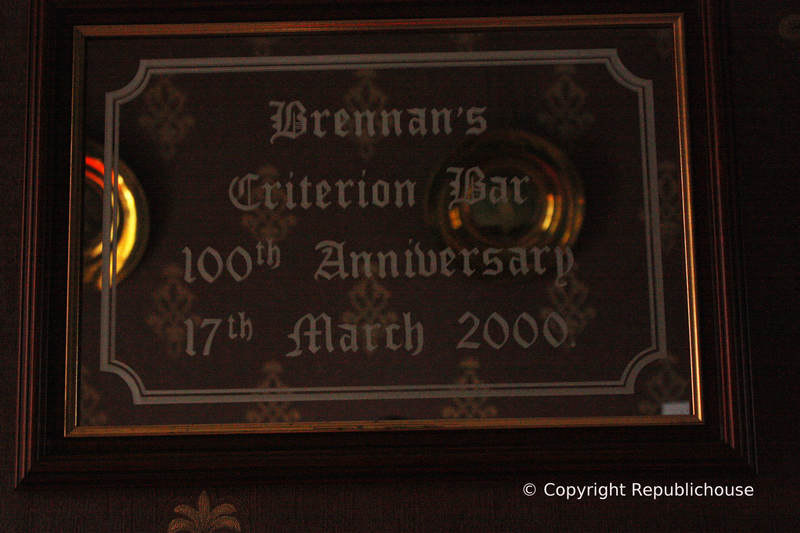 The Brennan sisters’ grandparents originally called the pub ‘The Criterion’ meaning ‘a standard by which something can be judged’. Whilst the pub is now commonly known as Brennan’s, it’s clear that the focus on maintaining standards has not been lost, as alluded to by the ‘Criterion Bar’ engraving in the front window. Indeed, Brennan’s has always set a high standard and continues to do so today. Styles come and go, but class is permanent and Brennan’s is a class act. Period. Visit because: Get away from the bustle & brashness of tourist-town Bundoran into a charming, relaxing bar locked in a freeze-frame of luxurious 1940’s decor, maintained under the loving ownership of sisters Nan & Patricia Brennan. My Great Grandmother’s piano is there with her name on it. It was her house in the late 1800’s, Some of my family have been there and were warmly welcomed by the owners. Hopefully in the next few years it will still be there when I travel to Ireland. Spent many a good night here last summer and will definitely call again if ever back in Bundoran. This place is all a good pub should be, from the warm welcome you get from the sisters that own it to the hand polished sparklingly clean glasses that your beer is served in. This pub oozes character and old world charm and it is spotlessly clean!! Friendly locals, no t.v or loud music and no SWEARING!! Hats off to the two ladies that run it with pride.